Discounts available for those who attend more than one workshop. These workshops are interrelated but amply rewarding if you can only fit one into your busy schedule. Those interested are welcome to attend one workshop, and invited (encouraged!) to attend more than one workshop. Consider giving yourself a year of extended playful exploration with ongoing community support by committing yourself to attending all four workshops. Each workshop is highly experiential, with ample time provided for creative improvisation with art materials, movement, writing and group collaboration. The patterns and personalities of play will be explored in each workshop, allowing participants to develop new play styles and practices that can be integrated into personal and professional life. The Indiana Behavioral Health and Human Services Licensing Board has approved this organization to provide Category 1 Continuing Education for LSW, LCSW, LMFT, and LMHC. However, licensees must judge the program’s relevance to their professional practice. Books, images, dreams, affirming messages are coming into my life, seemingly randomly, synchronistically. These threads are being woven, are still loose and unfinished…this writing will leap from idea to experience to image… more is being given than I can yet know. Like the bears, I am responding to the challenges and ambiguity of ever evolving life, by playing. 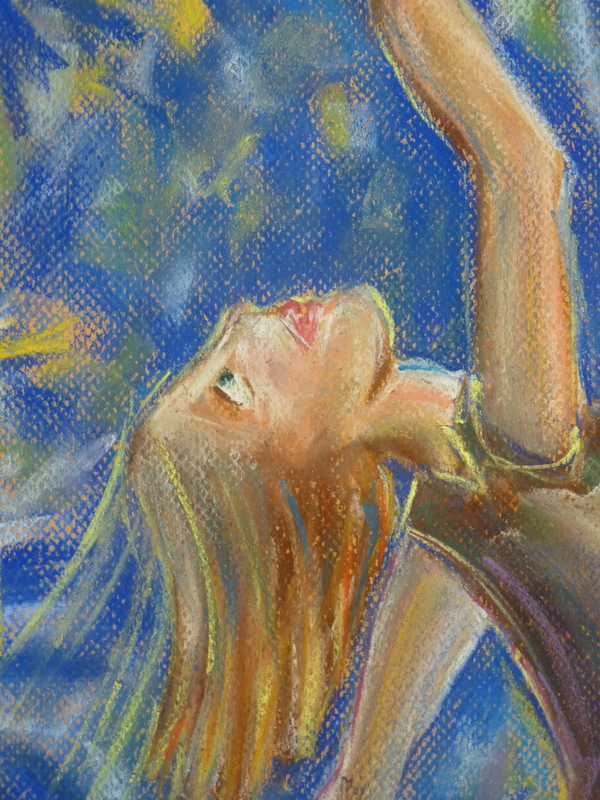 I am drawing an image from a favorite folk tale about a girl who dreams of touching the stars. I draw her over and over, not satisfied. I need to keep drawing the arc of her reach so that I can feel my own body reaching for my dreams. I make a chalk version of this image. 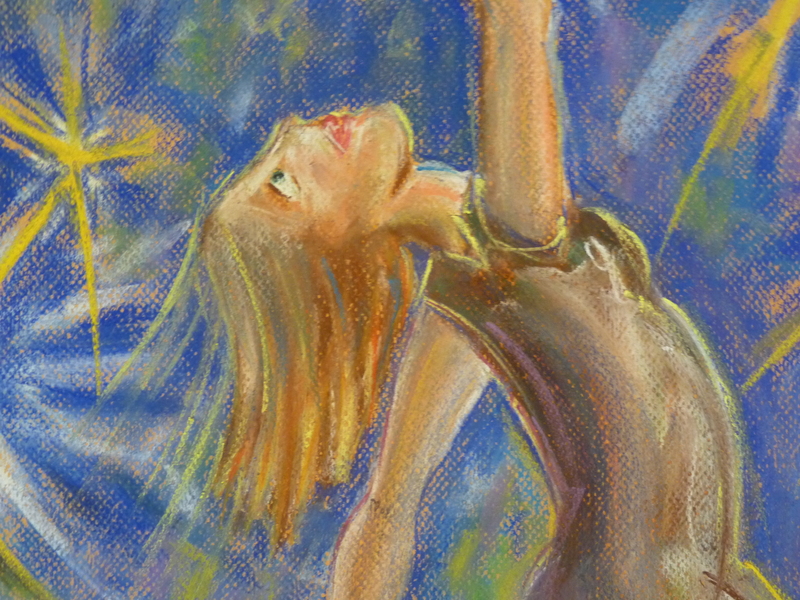 Still frustrated, I use the camera to look at the chalk drawing from different angles, different cropped views, trying to see what is essential in this image of reaching for the stars. The morning before a day of play, I have a dream. I am asking an artist this question: How do I change direction in my art making – when I know I am stuck in a rut – without shutting down my process through being overly critical of myself? I wake before the artist answers. I dance in the shower. An idea for a new direction comes to me. Draw lifesize dancing women. But not yet, something says, not yet. I need a break from drawing. Don’t rush this process – don’t force. I write in my journal. I doodle. I read. Books that inspired me years ago recross my path. A few days later, a free evening, unexpectedly. A friend has introduced me to the music of Baaba Maal. I down-load some of his music and it makes me want to dance. So I dance. Years ago, as a kid with childhood rheumatoid, I danced to 45’s, hit singles from the early 1970’s. Hours of dancing. Later, in college, in the early 80’s, I was in the middle of the crowd at every dance party. When my daughter was little, a toddler, we danced, sometimes both of us naked in our living room. I wasn’t going to let myself get too busy, too grown-up to stop dancing. But the times between dancing get further and further apart. It feels so good to be dancing again. Why have I waited so long to let myself do this? I close my eyes and move. I start to feel it happening – this shift I have felt since I was that young girl dealing with an illness that scared me. The way the music becomes part of my body. The way my body becomes reverent while dancing. Elated and reverent. 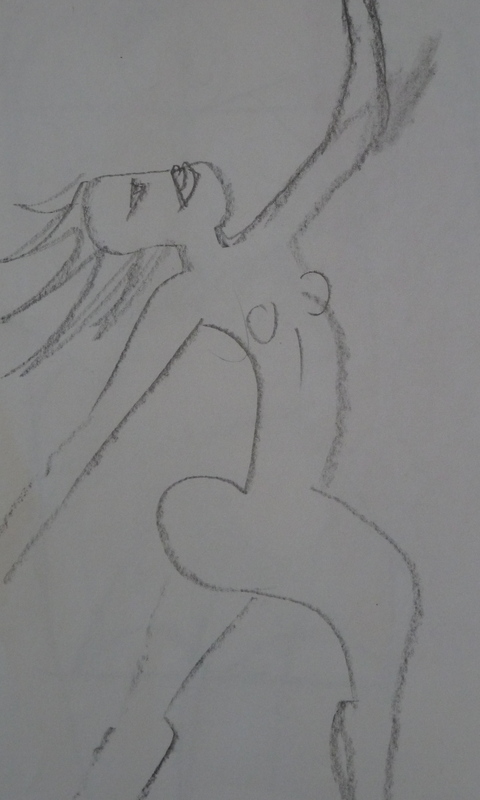 And the way I almost see – definitely feel – other dancers, ancient ones, a ring of them encircling me, protecting me, when I keep dancing, keep my eyes closed, go deep enough into the music. The guardians of the dance. I realize I want to make something to honor them. Another Wednesday arrives. I tape a large sheet of butcher paper to the wall. Use my new Crayola markers, in a pack of 50 colors with 12 scented ones. 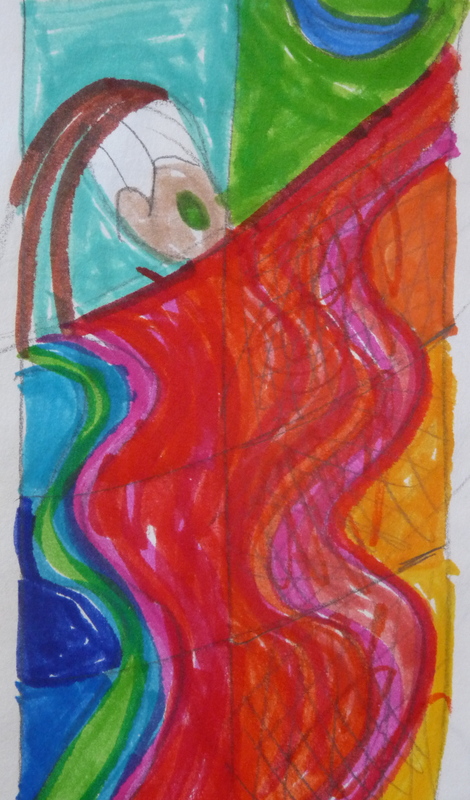 I draw a large Guardian figure, fill of movement, energy, welcome. I have kept most of my doodles and sketches out of sight after making them, feeling that it is too soon to let others see my play creations. I leave this bold, bright, big guardian figure up on the wall of my living room. I don’t want to curl the paper up and put it away – doing that would take some of the life and energy out of the process. Since making her, I have found myself increasingly aware of how grateful I am for this time to creatively play. It is essential to me. Having lived without it, having found my way back, I know now how absolutely essential it is. I don’t want to stop – in between times of play, I am preparing for when I can return, I long to continue, I look forward to what happens next. I love the improvisation. The relationship. With myself, with more than with myself. With the process. With living. I find myself thinking: I must guard this, protect this, cherish this. I must be the guardian of my own dance! 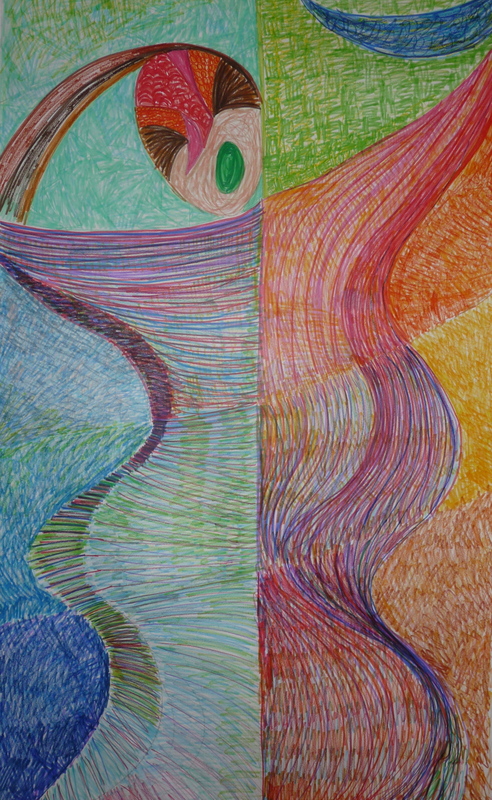 You are currently browsing the Expressive Art Therapy and Dreamwork with Liza Hyatt weblog archives for March 2011. Expressive Art Therapy and Dreamwork with Liza Hyatt syndicates its weblog posts and Comments using a technology called RSS (Real Simple Syndication). You can use a service like Bloglines to get notified when there are new posts to this weblog.